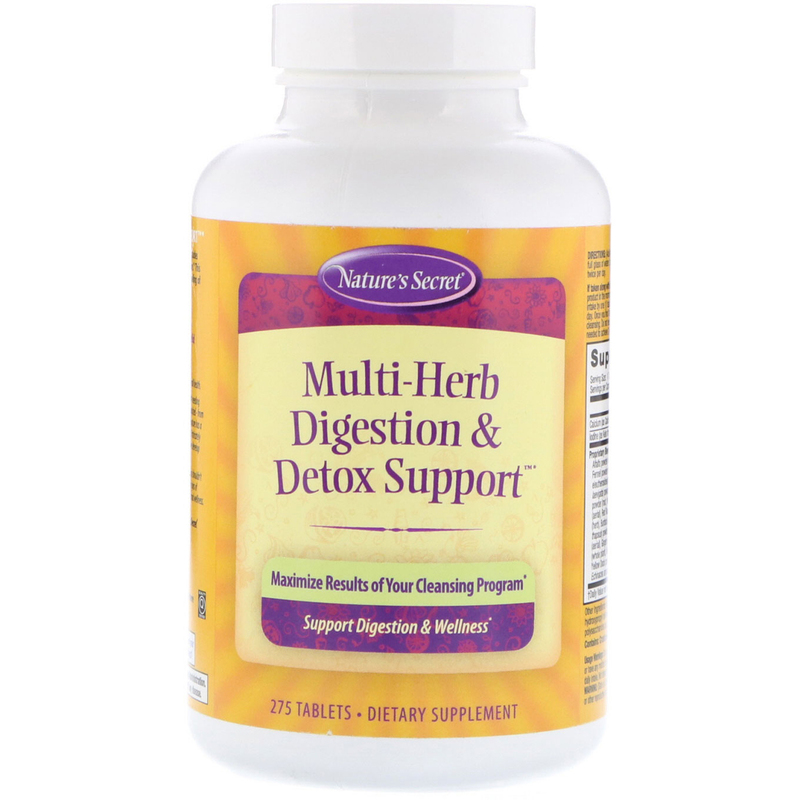 Nature's Secret Multi-Herb Digestion & Detox Support includes herbs that are traditionally used to support digestive function. 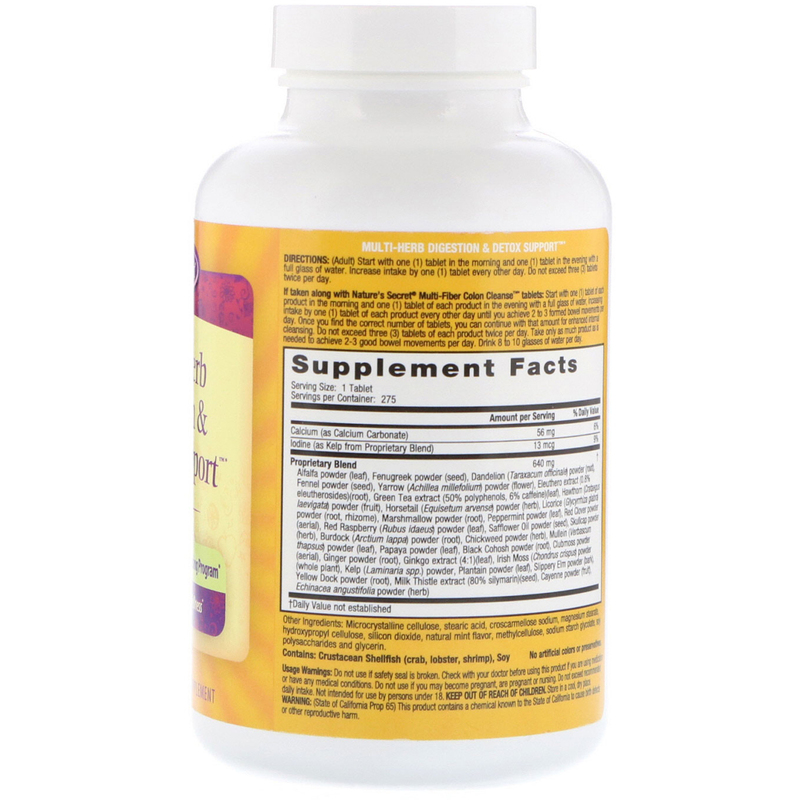 This proprietary blend works to support optimum health and a feeling of rejuvenation. The conventional approach to health sees the body as a set of separate parts, each needing their own separate treatments. Take a look at the way our medical system is organized-from cardiologists to dermatologist, we have a doctor for nearly every body part. But nature has a well-kept secret...there is no separation between any of our systems. They are all intricately connected in a brilliant dance only nature could orchestrate. At Nature's Secret, we develop our products using this whole-body philosophy. (Adult) Start with one (1) tablet in the morning and one (1) tablet in the evening. Increase intake by one (1) tablet every other day. Do not exceed three (3) tablets twice per day. If taken along with Nature's Secret Multi-Fiber Colon Cleanse tablets: Start with one (1) tablet of each product in the morning and one (1) tablet of each product in the evening with a full glass of water, increasing intake by one (1) tablet of each product every other day until you achieve 2 to 3 formed bowel movement per day. One you find the correct number of tablets, you can continue with that amount for enhanced internal cleansing. Do not exceed three (3) tablets of each product twice per day. Take only as much product as is needed to achieve 2-3 good bowel movements per day. Drink 8 to 10 glasses of water per day. Microcrystalline cellulose, stearic acid, croscarmellose sodium, magnesium stearate, hydroxypropyl cellulose, silicon dioxide, natural mint flavor, methylcellulose, sodium starch glycolate, soy polysaccharides and glycerin. (State of California Prop 65) This product contains a chemical known to the State of California to cause birth defects or reproductive harm. Usage Warning: Do not use if safety seal is broken. Check with your doctor before using this product if you are using medication or have any medical conditions. Do not use if you may become pregnant or nursing. Do not exceed recommended daily intake. Not intended for use by person under 18. Keep out of reach of children. Store in a cool, dry place.